“Our goal was to create a fundraising campaign a little different than the normal ‘please donate’ routine,” said ORBA Public Relations Director Jeff Knoll. “The board came up with a great idea, the VIP Experience Package that will include a private lunch with some of the biggest names in the sport including Brian Deegan, Casey Currie, Ivan Stewart, Shannon Campbell, Johnny Greaves, and more. In addition to the Lunch with the Legends, VIP pass holders will benefit from a VIP parking area, an all access entry into the event both days, and a guaranteed to win raffle with an average prize value of $200. One hundred percent of the money raised through the sale of the VIP Experience Packages will be donated to ORBA who has helped lead the way in the protection of the Johnson Valley OHV area, as well as other areas important to OHV users. The Lucas Oil Off-Road Expo hopes to build on this event annually in an effort to shore up the OHV access groups that keep our sport alive. Without Trails We Have No Sales is the mantra of ORBA and the organization hopes to continue their recent success with strengthening membership, and spreading the message to the entire industry. 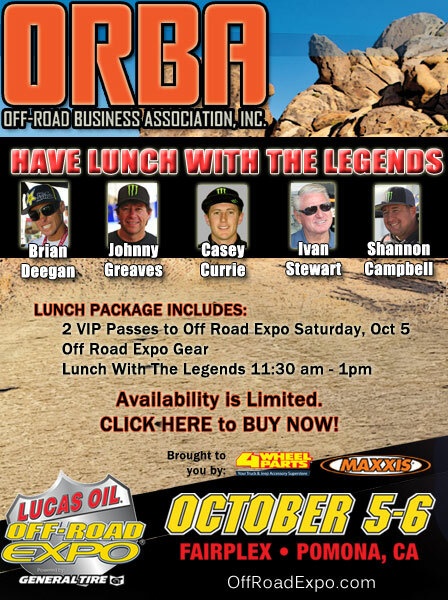 For information or to purchase a VIP Experience Package, please contact Lindsay Hubley at lhubley@familyevents.com or go to www.Offroadexpo.com. The 2013 Lucas Oil Off-Road Expo powered by General Tire will showcase everything off-road including new vehicles, thousands of parts and accessories, Toyota off-road test drives, racing demos from the King of the Hammers and Lucas Oil Off Road Racing Series and more on Saturday, October 5, from 9 a.m. to 6 p.m. and Sunday, October 6, from 9 a.m. to 5 p.m. The Expo will take place at the Pomona Fairplex, located at 1101 W. McKinley Avenue in Pomona, Calif. Advance discount tickets are available at www.OffRoadExpo.com for $10 adults and $5 children (ages 6-12). Kids 5 and under are free. Tickets may also be purchased on-site for $14 adults, $5 children. A Family Four Pack is available for $22 and includes admission for two adults, and two children (available online only through Friday, October 4). For more information, visit www.OffRoadExpo.com. Follow the Lucas Oil Off-Road Expo atwww.facebook.com/OffRoadExpo and at www.twitter.com/OffRoadExpo.